September is New York Textile Month! In celebration, members of the Textile Society of America will author Object of the Day for the month. A non-profit professional organization of scholars, educators, and artists in the field of textiles, TSA provides an international forum for the exchange and dissemination of information about textiles worldwide. To viewers familiar with Lenore Tawney’s iconic Woven Forms—tall, sculptural works in black and natural linen—the exuberant Reflections from 1959-60 may come as a surprise. Only two years before its creation, Tawney had moved to New York at the age of fifty to establish herself as an artist. 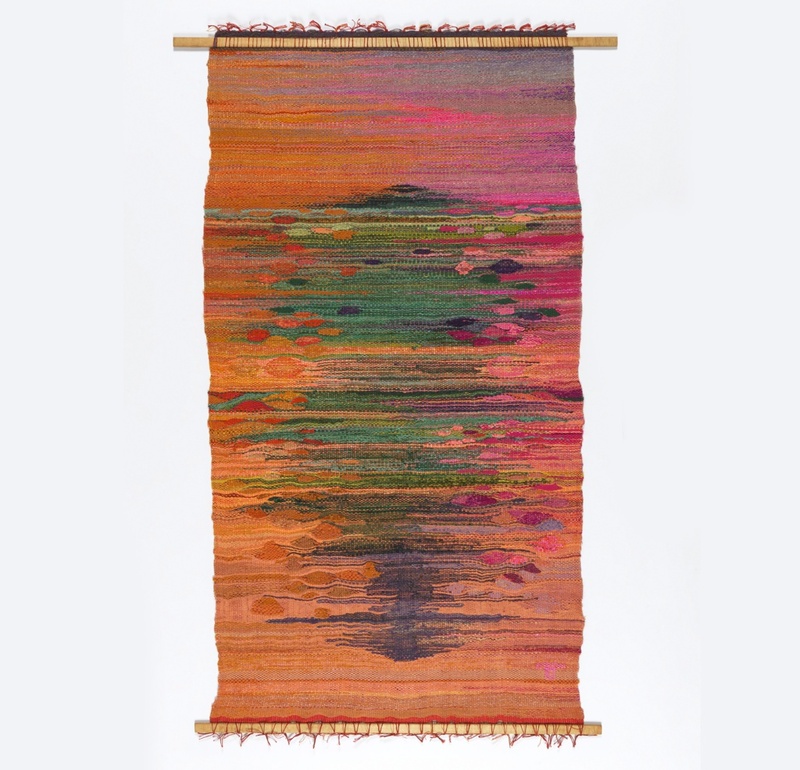 She had studied tapestry design with Martta Taipale at the Penland School of Crafts in 1954 and begun to weave in earnest. Tawney recalled Taipale saying “Color is like music,” and added, “I could see color soaring like Gothic arches in the sky.” St. Francis and the Birds, Tawney’s first tapestry of her own design, reflected this inspiration. “I was going to do it in dun colors,” she said, “but it didn’t turn out that way. The red and yellow and pink crept in; the purple sidled up.” Reflections shares this palette. In its rich colors and textures, it is characteristic of Tawney’s early work. But it also shows her moving toward abstraction with a painterly approach to form reflected on a shimmering surface. Reflections was part of this early history. With both ties to tradition and indications of new directions, it represents an important moment for Tawney, on the cusp of change. Kathleen Nugent Mangan is the Executive Director of the Lenore G. Tawney Foundation. I LOVE this piece of Tawney’s work and wonder where I might see it? does it get shown somewhere?